While there are several dining options on Fremont Street, Pop Up Pizza is the place to go to for freshly made, downtown-style pizza. Whether you plan to be on Fremont Street or you are looking for a downtown dining experience that is different from others you have enjoyed, Pop Up Pizza is the place to go. There are numerous restaurants, cafes and other dining options on Fremont Street in Las Vegas, but you will be hard-pressed to find a dining experience quite as amazing as what you will enjoy at Pop Up Pizza. In fact, there are several good reasons why you should make plans to treat yourself to Fremont Street pizza in Las Vegas at Pop Up Pizza. At Pop Up Pizza, you will not find pizzas and other menu options made from frozen or processed ingredients. This is a restaurant that strives to provide Las Vegas area customers with freshness and quality in all of the foods prepared. The restaurant is best known for its pizzas, and there are an extensive range of fresh ingredients that are available to use for toppings. The pizzas can be customized based on your specifications, and you can even choose from vegan options. This gives this restaurant’s pizzas a unique flair that sets it apart from other pizza options available throughout the Las Vegas area. While most people who head to Fremont Street and dine at Pop Up Pizza will choose to enjoy a freshly made, downtown-style pizza, there are many other menu options available to choose from. You can choose alternative menu options or side dishes to pair with your custom pizza creation, and some of these options include onion rings, chicken tenders, garlic fries and more. There are also many beer and wine options, soft drinks and even soft-serve ice cream for you to enjoy for dessert. 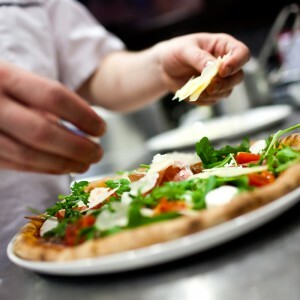 With so many menu options, there is something for everyone to enjoy at Pop Up Pizza. Pop-Up Pizza has a wonderful ambiance that is ideal for enjoying a meal with family or friends. For lunch or dinner, you can dine in the restaurant on Fremont Street. You can also place a takeout order or request delivery.